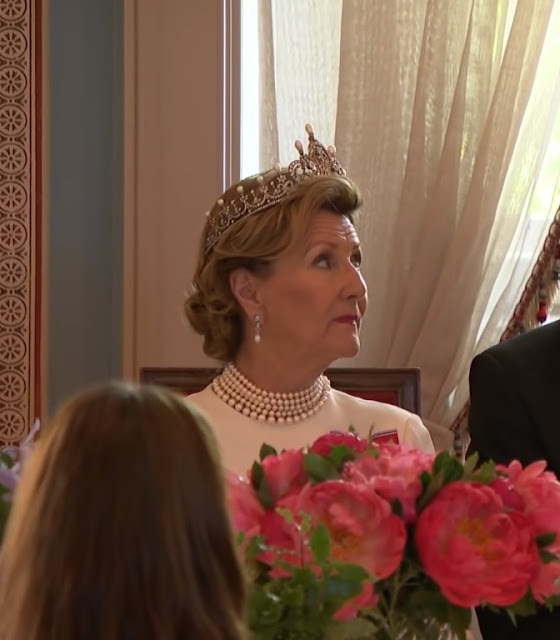 New week, new tiaras: Norway's royal family welcomed the President of Slovakia for a state visit yesterday. The welcome ceremony is much as we've come to expect from Crown Princess Mette-Marit, meaning something white + a headband. Queen Sonja's tangerine suit added some welcome warmth to the group. The evening's state banquet was pretty much as we've come to expect from Sonja, who picked up the white dress flag from her daughter-in-law. She added Queen Maud's Pearl and Diamond Tiara on top, one of her favorites, with plenty of additional pearls. Princess Astrid was there also, wearing her winged aigrette. Seems to me that Mette-Marit has found a new appreciation for her Amethyst Necklace Tiara and parure (she's wearing the brooch/necklace pendant on her bodice here), and I need hardly tell you (again) that I am all for that. Especially here, because this gray dress needs the extra color from the gems. ...eight years ago in Denmark for the celebrations of Queen Margrethe's 70th birthday, where it was part of a dress with a white top with flounce sleeves. The top she's now added to the skirt is a lot like the one she wore in the portrait above with different sleeves; as Heaven points out, the same collection also offered different but similar tops with larger sleeves. The top(s) are from a 2013 collection from Biyan and feature an embellished neckline. The result of this dress remix leaves me longing for the 2010 original, I'll admit; the white top did a lot to balance out the gray and all the embellishment of the skirt. Embellishment and gray all over ends up cluttered. But I'm totally intrigued by her process of mixing and matching with her gala gowns. Infinite possibilities!